This is the first decal sheet that I have reviewed from Afterburner decals and I am quite impressed. 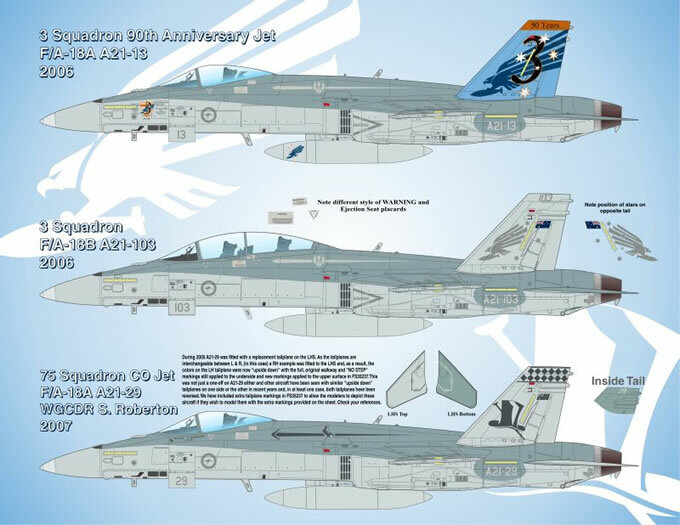 Afterburner Decals’ 1/48 scale “Aussie Hornets Part One” contains markings for eight Australian F/A-18s including four anniversary schemes. 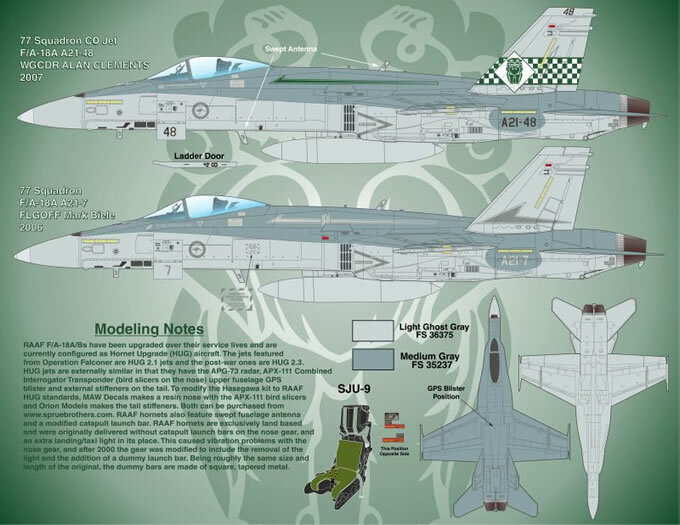 The guys at Afterburner Decals have sought and gained permission to use and print RAAF emblems under Crown copyright. 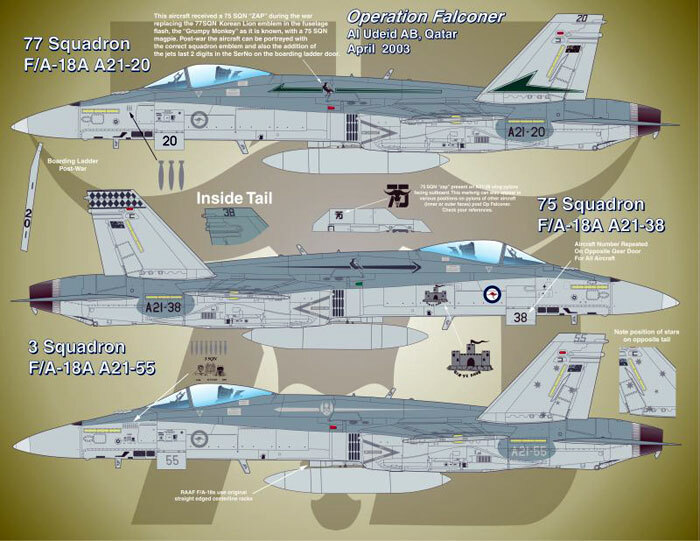 F/A-18A, A21-20 of No 77 Sqn depicted during Operation Falconer based at Al Udeid Air Base in Qatar in April 2003. The aircraft has the standard high visibility No 77Sqn markings but the Korean fighting dog emblem on the fuselage has been replaced with the No 75Sqn Magpie emblem on the fuselage spine. This aircraft has 3 bomb symbols on the nose. F/A-18A, A21-38 of No 75Sqn depicted during Operation Falconer based at Al Udeid Air Base in Qatar in April 2003. The aircraft has the standard high visibility No 75Sqn markings. This aircraft has a castle with the legend Gin ye Daur painted on the right hand side of the forward fuselage. F/A-18A, A21-55 of No 3 Sqn depicted during Operation Falconer based at Al Udeid Air Base in Qatar in April 2003. The aircraft has low visibility No 3Sqn markings. This aircraft has 8 bomb symbols on the nose and what looks to be an 85th anniversary 1916 to 2001 motif painted underneath the bomb symbols. This portrays 2 pilots dressed in period flying equipment with the 3 Sqn emblem painted between them. F/A-18A, A21-13 of No 3 Sqn 90th Anniversary Jet in 2006. The aircraft has the vertical stabiliser painted in the 3Sqn light blue. This area has a large dark blue eagle carrying a bomb in its talons, a large black 3, and a large white Southern Cross Star symbol painted over the light blue. The Stars of the Southern Cross and the number 3 are outlined in orange. A shield with the anniversary tail marking is painted on the forward left side of the nose. The shield has the Squadrons battle honours listed around it. F/A-18B, A21-103 of No 3 Sqn in 2006. The aircraft has a large Medium Grey eagle carrying a bomb in its talons painted on the vertical stabiliser and has the standard Southern Cross Star symbol painted over the eagle. F/A-18A, A21-29 of No 75 Sqn the Commanding Officers Jet WGCDR Steve Roberton in 2007. The aircraft has the large Black Top Hat and Can painted on the vertical stabiliser and the high visibility fuselage spine chevron with the boomerang and Magpie emblem. F/A-18A, A21-48 of No 77 Sqn the Commanding Officers Jet WGCDR Alan Clements in 2007. The aircraft has the large high visibility green and white chequered band with a large white diamond containing a large green Korean Fighting Dog. The Korean Fighting Dog became 77 Sqns mascot emblem while the squadron was station in Korea flying Meteors during the Korean war. The Fighting dog is sometimes referred to as a Korean Lion. F/A-18A, A21-7 of No 77 Sqn with FLGOFF Mark Biele painted on the nose 2006. The aircraft has the standard low visibility 77 Sqn markings. 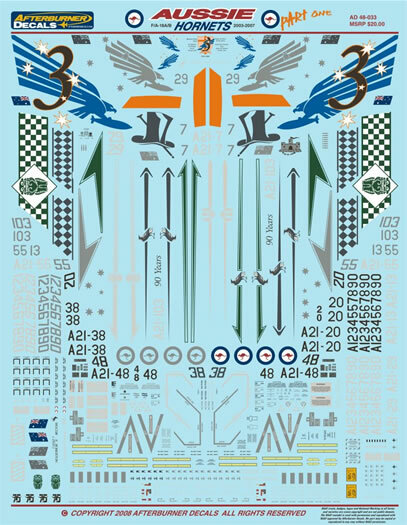 At least two complete sets of data decals are provided as well as detailed profiles displaying data decal placement and some reference notes pointing out differences in the aircraft as they are continually upgraded by the RAAF. You will need to refer to other reference material to determine the actual upgrade to the aircraft that you are depicting. Finally the instruction sheet is printed in gloss colour and contains a weapons load chart. The decals are superbly printed by Cartograf of Italy, with good colour saturation and excellent register. The carrier film is ultra thin and my experience with Cartograf printed decals that I have used in the past is that the decals have to be handled carefully and they snuggle down into the surface detail well. I always use decal setting solution but this is not necessary with Cartograf decals. The carrier film then almost totally disappears under a coat of clear. Afterburner Decals acknowledge two fellow Australian colleagues who provided important knowledge, time and effort, these being a work colleague of mine named Darren Mottram and fellow HyperScale reviewer Ken Bowes. 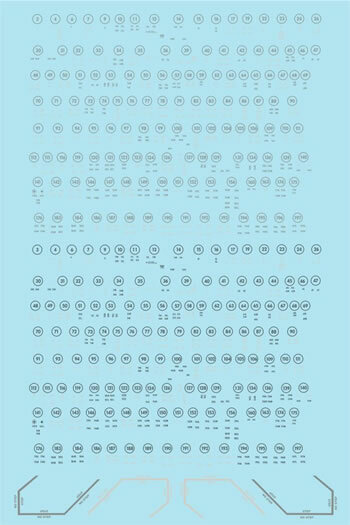 These guys have assisted in making this sheet as accurate as possible. Having seen most of these markings come through our maintenance hanger I can comment favourably on the accuracy of the details and the accuracy of the colours.